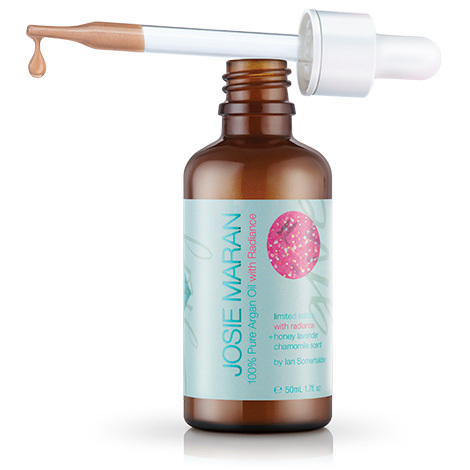 Doing good is a beautiful thing, and there’s nothing more beautiful for your skin, hair, and nails than Josie Maran’s 100% Pure Organic Argan oil. Like her original argan oil, this limited-edition, lightly shimmering Argan oil is a superior source of nourishing antioxidants, Vitamin E, and essential fatty acids but has a beautiful radiant shimmer to give you that "glow" from within. What you can use it for: Use as a daily facial moisturizer, to treat hair and split ends, condition cuticles, and moisturize your body. Argan oil amazingly controls sebum production and balances the skin's natural oils while reducing the appearance of fine lines and wrinkles. It's truly a multi-tasking natural wonder. The light luminous, shimmer adds instant radiance to skin and hair; the mild Honey Lavender Chamomile fragrance calms and soothes the senses. Sounds sooooooo good and skin nourishing right?! Argan oil is especially great for moms and moms to be since you can use it on you and your baby or child and feel good about the organic, pure ingredients! What's even better about this limited edition radiant Argan oil is that ten percent of sales will be donated to the Ian Somerhalder Foundation, founded by the actor and activist, to help build the ISF Animal Sanctuary. Which is a project dedicated to rehabilitating neglected, mistreated and misunderstood animals. So do good for yourself and support a great cause at the same time and order yours here.